We were delighted to have time in our hectic schedule to make it to a branding this year. 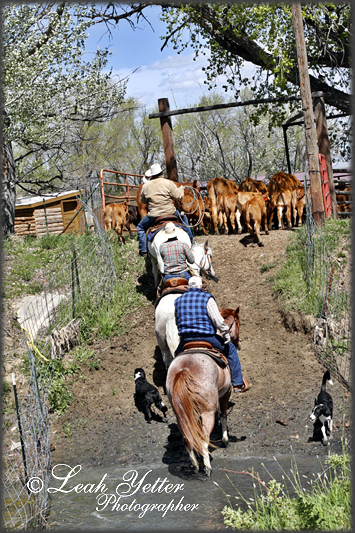 We got the invite and jumped in the Ranger for the half hour trek through the hills to the neighbors corrals. 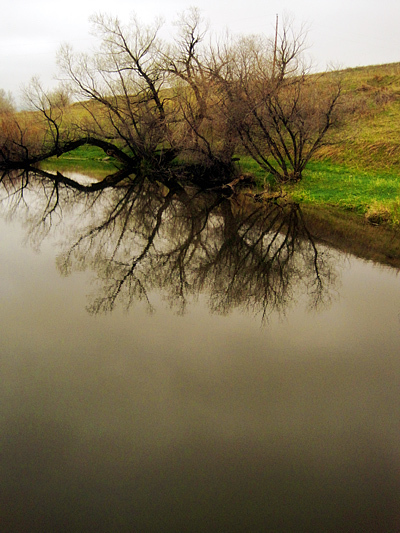 It started out overcast, cold and windy. 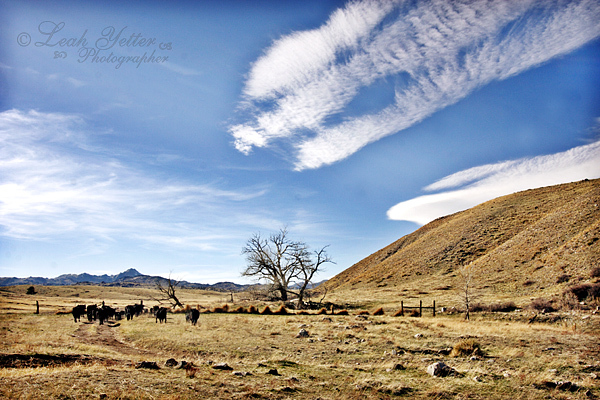 The cowboys set out across the pasture with me in tow. In an atv of course. I have quickly learned that if I want to shoot, it’s best I don’t mount a horse and try to do both at the same time. I’m not the best multi-tasker. 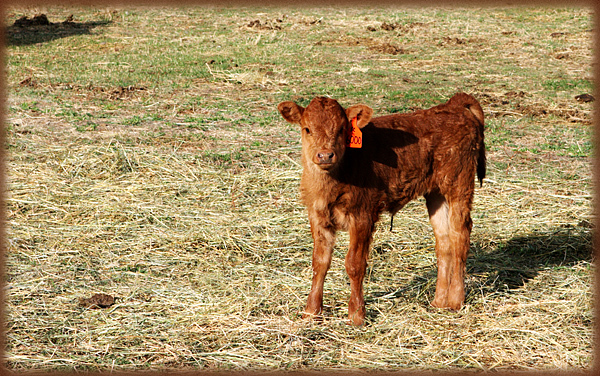 It’s a good thing I had the atv because I had to pick up a little sickly calf along the way. He just couldn’t make the trail. We treated him and he’ll be fine in no time. Just a touch of an upset tummy. 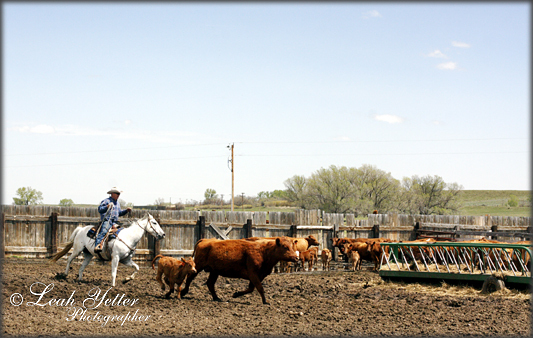 A few little ones got out of the sorting pen so a couple guys had to rope them back in. The clouds parted by mid-morning and it warmed up nicely. While the babies mothered up after getting their hides burned, we all enjoyed a nice meal with old friends and made new friends. 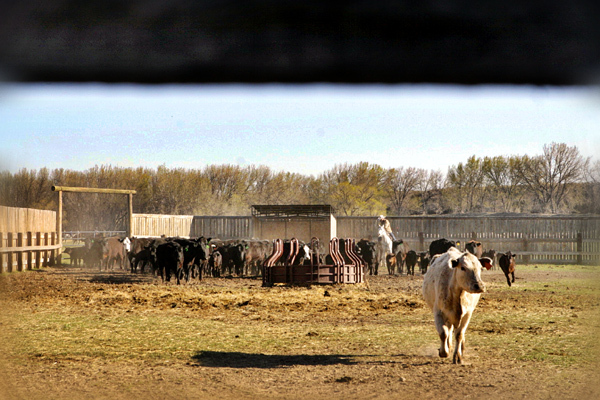 Brandings are not just about the calves, but about neighbors, friendship, and laughter after a busy calving season. 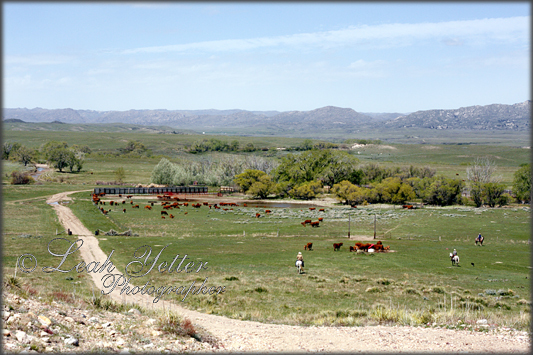 It also means now they all go out to new pasture for the summer and graze until their hearts (and bellies) are content. Ahh… the circle of life. 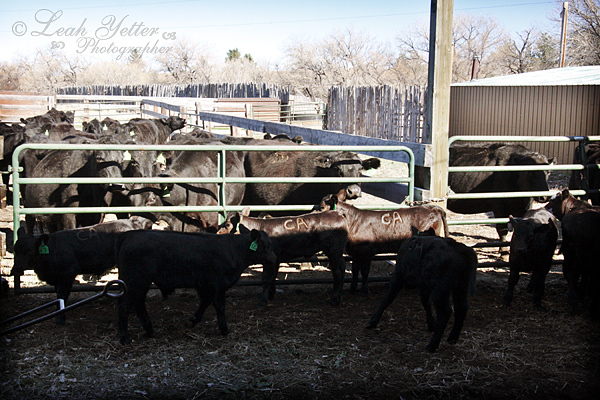 Our crew from back east took charge a couple of weeks ago and branded the last batch of calves. and into the branding pen. 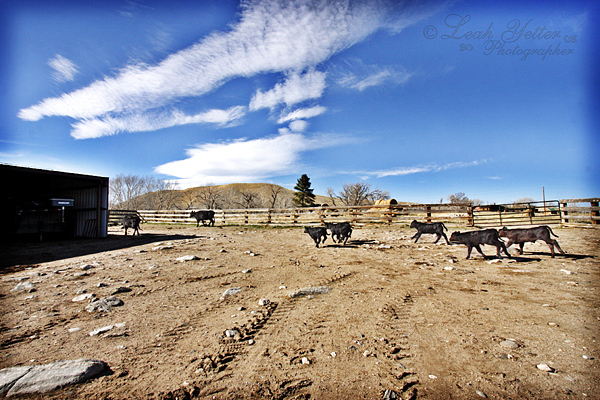 They sorted the mothers from the calves and led them out of the corral. Reagan and Marley were great spectators. These guys were also in the audience. They snorted and stared and were as grumpy as ever. And then the roping began. 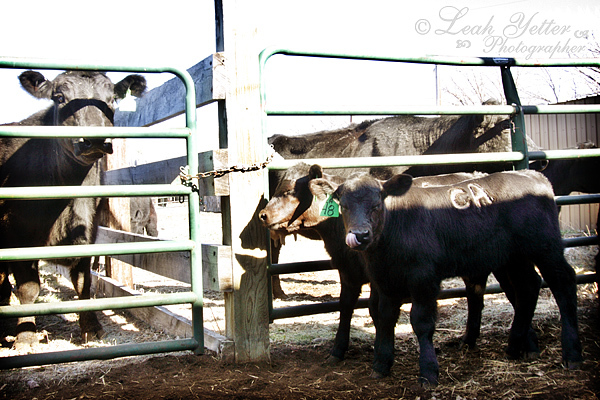 Tommy and Hillbilly worked hard and did a great job of bringing the calves in so they could be vaccinated and branded quickly. Once they were down, the ground crew swooped in and had them up and at’em in no time. 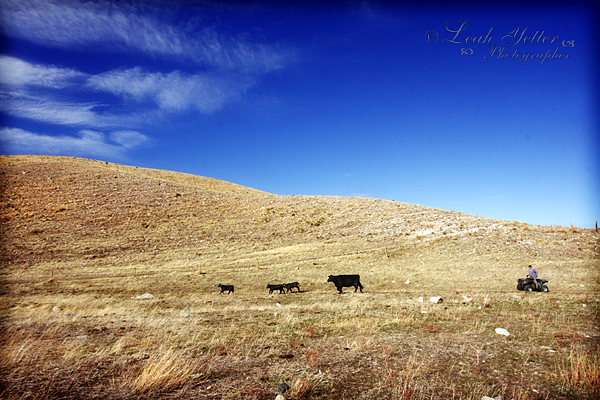 One little one tried to get away but Patrick and Jack guided him to the rest of the herd. 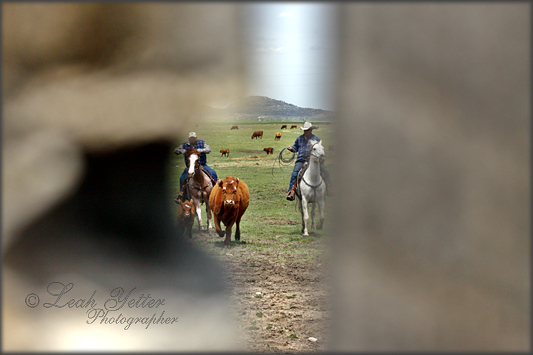 They went right in to the corral, with the encouragement from those on horseback, and waited. On the last day of their visit, Marley’s mom and sister went shopping so we decided to have a photo shoot. Marley was a fantastic model and we had a blast taking her “cowgirl portraits”. We dodged a few raindrops and had moslty cloudy skies. But the sun popped out every now and then and we were dolloped with some lovely light. All in all it was a great visit and even though we put them to work, I hope they enjoyed it! We were invited to a couple of brandings in early May. Yes, you’ll see a lot of Patrick on horseback, you know I can’t resist. But if you were wearing a cowboy hat, you were also focused on closely. The weather, as I’ve stated before, is so unpredictable out here. I got sunburned at Tom’s on the 5th and we froze our fannies off at the Smalls’ on the 7th. Go figure. Click the images below to view the gallery of each of these 2 brandings. Sunny but cold at Kenny and Patty Small branding, May 7, 2010. 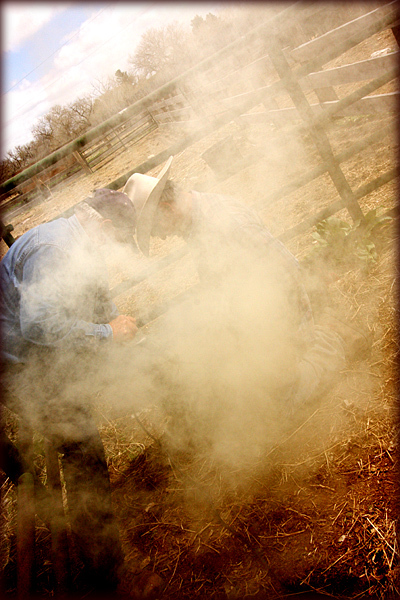 Hot and dusty at Uncle Tom's branding, May 5, 2010. 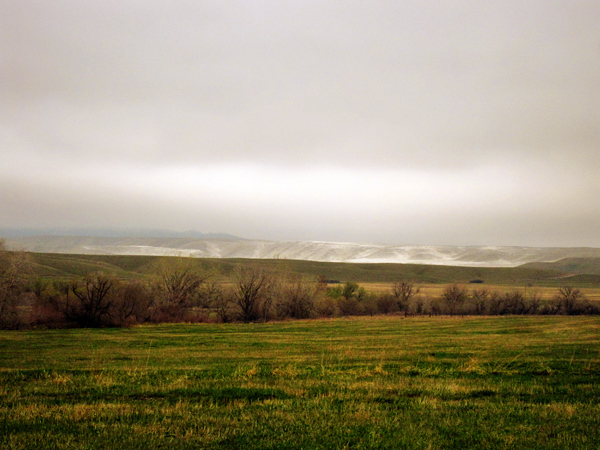 Yes folks, this day in May the wind howled and snow fell. 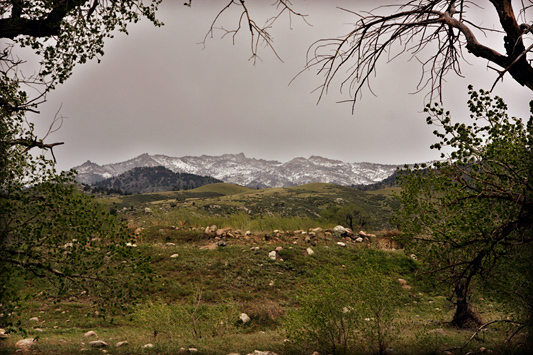 Patrick grabbed my camera and took a couple shots of the mountains behind the house. Squaw Mountain. Image by Patrick McGuire. The Lawrence. Image by Patrick McGuire. We worked all day Sunday. The weather was much better yesterday than today. 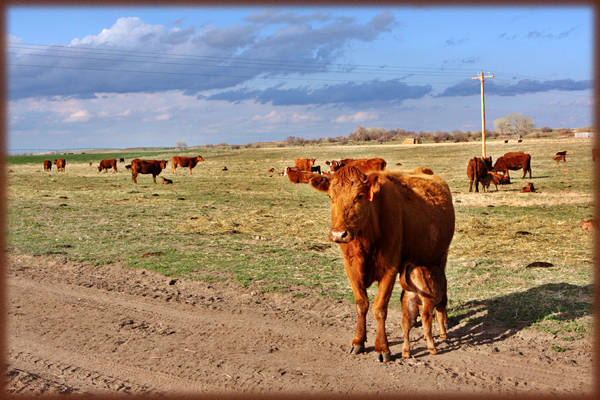 We got 43 mommas and their babies paired up to be trucked to the Laramie Plains today for more grazing. John’s cow dog, Dixie, did a great job. She perched at the top of the hill until John told her to come. She’s very obedient and works hard. 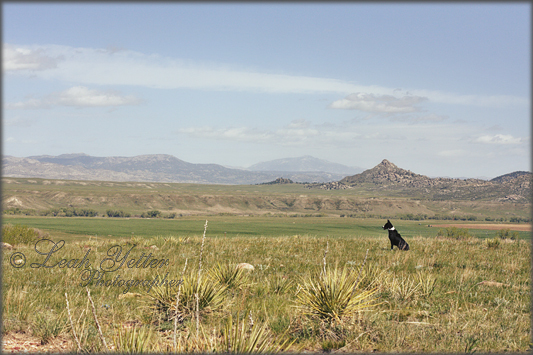 Dixie and I sat at the top of the hill and watched the cowboys work. They're all down the hill thankfully. They all crossed the creek by golly! 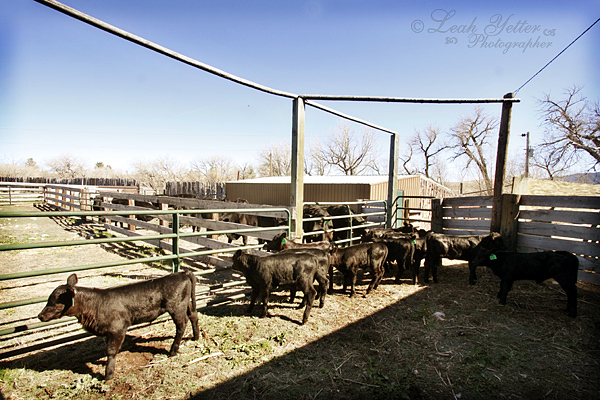 Once in the main corral, we had to make sure the babies were paired up with momma and then put them in separate corrals for the big delivery. They are going to love the Plains. The grass is getting greener by the day. We needed to get a few more pairs from the meadows. I was told to get behind the fence and DON’T BE SEEN! Watching through the knot hole. I'm hiding, Patrick! Through the knot hole: Ron and Patrick work their magic. Branding. It’s exhausting. 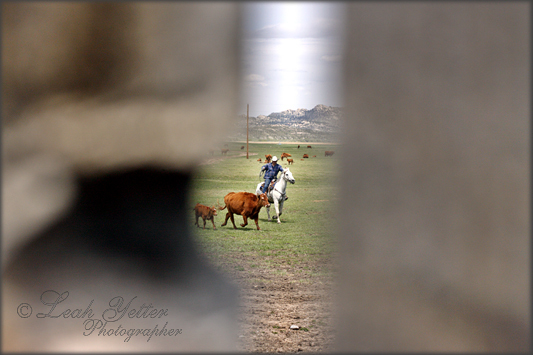 Not only for the cows but for the cowboys and girls too. We branded at Uncle Tom’s yesterday and Friday we’ll be at Kenny’s. She's looking for her baby while that cowboy back there rounds up the stragglers. I’ll have more images up soon but for now, the only shots I’m concentrating on are the vaccines for the babies to keep them well. Branding Day, the storm before the storm. 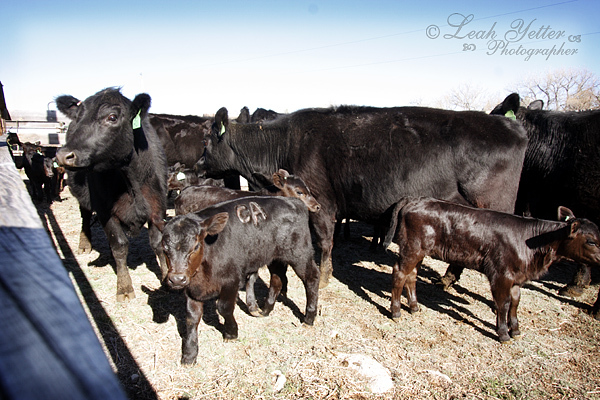 Yesterday we branded 68 calves. 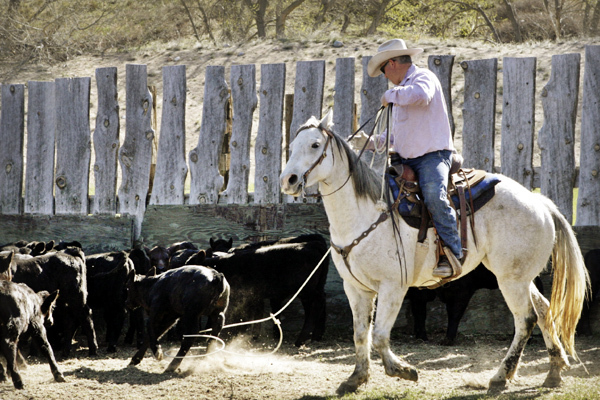 We did most at the South Ranch and a few of the wilder ones at the main ranch. It’s always tough to watch the babies be split away from their mommas for their shots and the 5C but it’s only for a short amount of time. When they are released back into the meadow, the mommas are able to find the babies quickly. 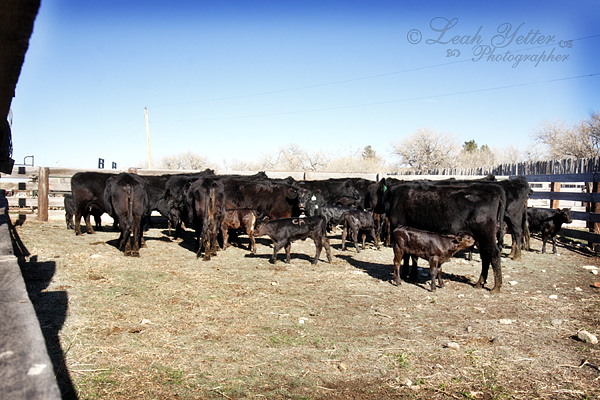 They mother up and get as far away from the corral as possible. Here, mommas are bawling for their baby. Smoke fills the air while they get their 5C. Remember Munchkin? I finally spotted him yesterday and he’s doing great! He’s too small to be branded yet but he’s nice and healthy. His momma doesn’t let him out of her sight. She’s taking great care of him. 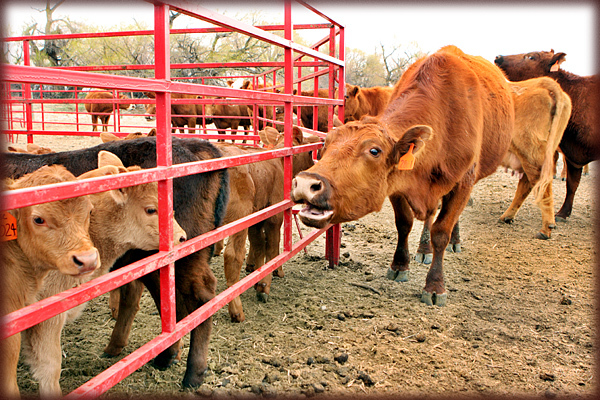 Unfortunately that can’t be said for all the cows out here. 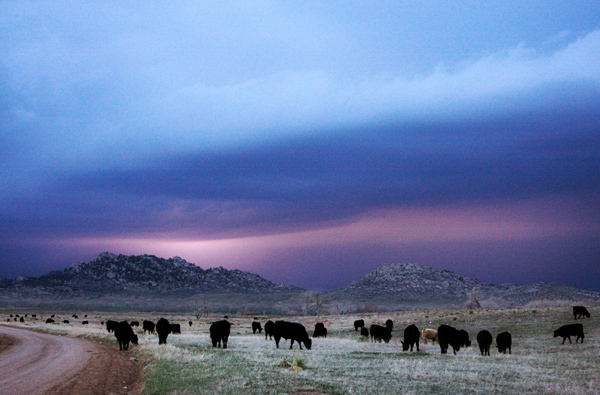 On our way home from the South Ranch we saw lightning in the distance. It was a nasty storm over Glendo and it was headed our way. We got home just in time before the sky fell. And I mean it poured, thundered, and hailed like I’ve never seen before. 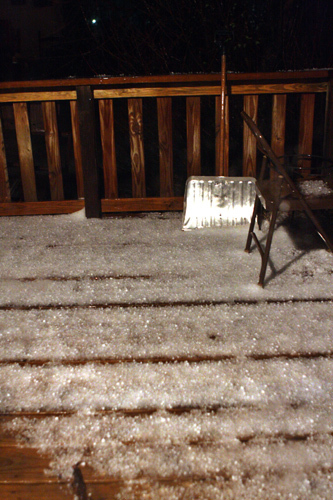 This is our front deck covered in hail. 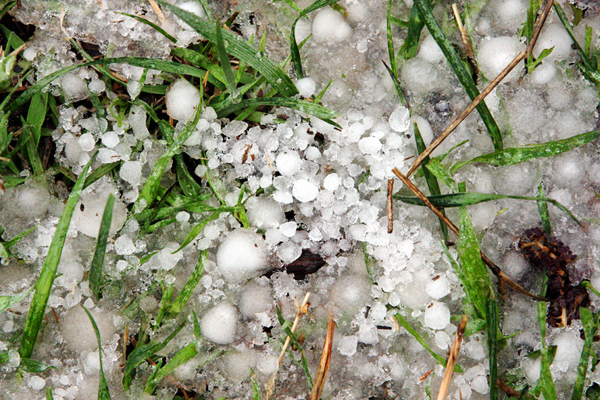 The yard this morning was covered in hail. While looking over the grounds today to make sure there was no damage from the storm (there was none thankfully), we came across this horn. 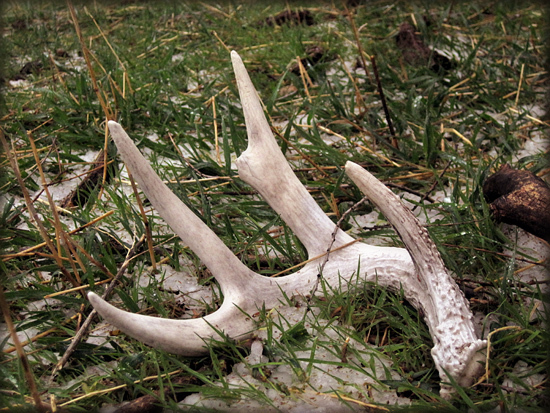 Deer lose their horns in December and start sprouting new ones almost as soon as they lose the old ones. 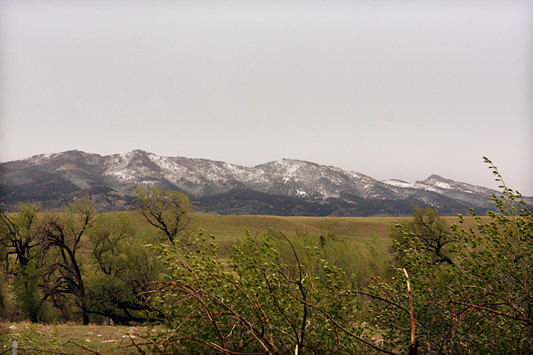 April snow capped mountains across a green meadow on Rabbit Creek. I think this is just the beginning of a stormy spring.